Hello everyone and thanks for dropping by for a visit! I hope you have been enjoying your weekend. Are you getting that little nip of cooler weather at your house? It has been so pleasant here over the last few days. I know it won't last - we always warm up again after our first little taste of fall. But, that's ok, I'm going to enjoy it while it's here. Peachy Keen Stamps has a really fun challenge going on this week. 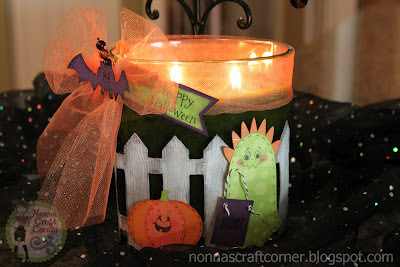 Something a little different - Challenge #36 is "3D Objects - Candle" decorate or use candles in your project. * Next, I started on my picket fence. The fence is from the Silhouette Online Store. I cut out 4 sections from Kraft paper, gluing 2 together for durability. * Now, it's time for the fun - I covered the fence with "Crackle Paint", appropriately named "Picket Fence"! After giving it time to dry, I inked up again, this time using black ink. * Then the fence was glued onto the glass using Zip Dry Paper Glue. (I cleaned the glass with alcohol first to remove any grease or dirt). * The pumpkin, monster and bat are all from the Silhouette Online Store and I used the "Monster Mash Face Assortment" and the "Pumpkin Faces" stamp sets from Peachy Keen to give them their adorable little faces. * The "Boo" sentiment on the trick or treat bag and the "Happy Halloween" sentiment are both from the Peachy Keen September Stamp of the Month Set. * I added some orange tulle ribbon and a couple of stick pins before adding the bat. In hindsight, the stick pins look a bit like antenna...hmmmm. And, bats don't normally have antenna (duh), but those little suckers are glued tight and aren't going anywhere...lol! So, just work with me here! So, thanks again for stopping by today! I always appreciate your visits and look forward to reading your sweet comments. I wish you all a wonderful week - and I'll be seeing you soon! OMGoodness! that is adorable! I love it! thanks for sharing I think i'll try to make something similar for my home. What a fabulous candle. I could see this sitting on my counter and being used often. That is a great scene you created around the outside. This is fabulous, Tanya! 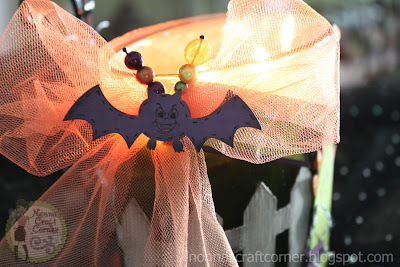 I love the look of the light behind the ribbon - especially with that fun bat!! My favourite is the tiny little treat bag with twine. How cute!! Too cute... love the little scene you created. Those faces are really cue. Great job Tanya! Love this! Especially your fence technique! Oh, this candle is adorable. All the details are great. This is so cute. Love all your details. Now I have to change the butterflies on my candles for something a little spookier. My grandson says we need more "spooky". This is sooooooo adorable! Love all the PK stamps and the great Halloween design! Tanya ~ well you did it again ~ another FABULOUS and ADORABLE creation! I just LOVE every single detail! You are so talented! I think it would look PERFECT on my coffee table! LOL! We have the feel of Fall here too! LOVING it just like you candle! Very cute! Love all those little touches--like the tulle, twine, and stick pins! WOW...this is WONDERFUL! I love the details! Sheer perfection! Love your awesome candle! Wow,this is awesome Tanya! What a fabulous home decor item.Love all the cuts you used but especially how you made your fence. So cute! LOVE the fence! So glad you joined us this week at Peachy Keen! This is so awesome! What a great job!! Thanks for sharing it with us over on the Peachy Keen Challenge Blog this week! Thank you for joining us at Simply Create Too Challenge #22. 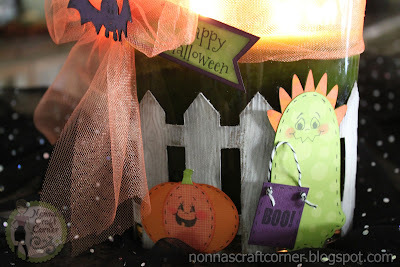 This is Spook-tacular! I just love the little fence and those faces are fantastic! Oh, I LOVE this! Amazing job! It is so freaking cute!